Dear meeting industry friends, it is once again time to gather a group of our most distinguished colleagues and rally around the flag. Yes, the annual Switzerland Meeting Trophy is upon us! The Switzerland Convention & Incentive Bureau is proud to invite you or one of your colleagues to strengthen the Belgian team on an exciting rally through the country from 27 to 30 June. On these days, you’ll compete with the other national teams, while also getting to know Switzerland in a playful way. You will travel by car, bus, train, boat and on foot; all the time discovering the many venues Switzerland has to offer. The goal may be to win, but the reward for all participants is a greater understanding of Switzerland’s meeting potential. This year the rally will take you to Zurich, Andermatt, Thun and Interlaken. You will see and explore lively cities, beautiful lakeside towns and secluded mountain villages, all to offer a glimpse of the variety and possibilities of Switzerland as a destination for meetings and incentives. Click here for a look at the complete programme. Be aware that this invitation is strictly reserved for account managers of specialised agencies based in Belgium in the meeting and incentive industry and that receiving this invitation does not guarantee you a place. 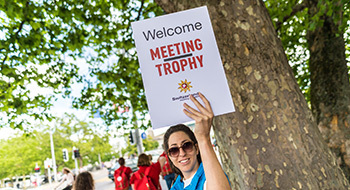 Only people that haven’t already participated in the Meeting Trophy are allowed to register. Are you ready to defend our Belgian pride? Don’t hesitate and register by filling in the form before 15 April. Myriam Winnepenninckx is at your service for further info.